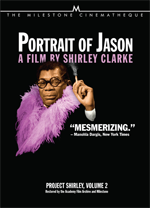 As part of their effort to recover and restore the works of filmmaker Shirley Clarke, Milestone Films has released Portrait of Jason on both DVD and Blu-ray. Even if you have no historical perspective, Jason (the film and the man) will amaze you. The Lost Confrontation. 7 min. Portrait Of Jason trailer. 2 min. Jason: Before and After. 1½ min. Jason Unleashed (audio outtakes). 35 min. Clip from Underground New York (1967) 9½ min. Pacifica Radio Interview With Shirley Clarke. (1967) 53 min. Jason In Color! 2½ min. Most of the high-voltage shock that jumped off the screen in the 1967 premiere of Portrait of Jason has been dimmed by the glacial social progress of society. Yet seen from the advanced heights of 2014, this film still packs a punch and all of it comes from the only man on screen, Jason Holliday, who says he is a gay black hustler and survivor living in New York City. Remember that this is two years before Stonewall and halfway through the Civil Rights Movement and a long, long way from Middle America. In 1967 Holliday was so far off the beaten path that America would not only not have understood him, they could not have imagined anything like him. In fact, I’d guess that most White Americans at the time would have zeroed in on Holliday being black before they thought of him as being a homosexual. Holliday is truly a self-made man, from his name on up, and it’s almost irrelevant if his stories are fictions too. In 1967 the amazing thing is that he’s saying any of the things that he is saying out loud. Simply being gay was illegal, and to come out was to admit to being a criminal. This must have come as a breath of fresh air to the gay audience and a bolt from the blue for the straights. But this being a Clarke film, things are not as they seem and as you watch, questions soon appear as when Holliday states that his real name is Aaron Payne, and that Jason Holliday is a fiction. Is this really an interview or is Holliday/Payne performing for the camera? More critically, is Clarke —who can be heard off-camera talking to him — for real or is the whole thing a staged and scripted interview? Or is Jason’s life such a muddle of masks and performance that his whole existence is a grand performance piece and Clarke is only providing him with a larger stage on which to act? Or is it all of the above? You can see how this can go round and round in your own head, more or less like the film itself does. Meanwhile Holliday continues to give one hell of a performance whether real, staged, or both. As an avant-garde filmmaker, Clarke has stretched the definition of documentary with Portrait of Jason but hit the nail on the head in naming this film a "portrait." Whether the subject is real or imagined is not important. Jason Holliday is a character you will not soon forget.